“Vajrasattva practice begins with bodhichitta and refuge. Then visualize Vajrasattva sitting one cubit above your head. A cubit is about the length of a forearm, from the tip of the middle finger to the elbow. Guru Padmasambhava, all the lineage masters, and all enlightened beings— particularly the Five Dhyani Buddhas—are completely embodied in the form of Vajrasattva. Vajrasattva is white in color, and can be visualized with or without a consort. In this version of the practice, Vajrasattva sits in the “royal relaxing posture;” his left leg is bent in, and his right leg is stretched out slightly. Although Shigpo Dudtsi does not specifically mention it here, other teachings say that Vajrasattva sits on a thousand-petal white lotus on top of a white moon disc. This instruction can be applied to this practice as well. Keep this visualization, and with strong devotion and concentration, begin chanting the Hundred Syllable mantra of Vajrasattva. As you chant the mantra, visualize that from the big toe of Vajrasattva’s right foot, bright white light descends like a stream. This stream of white light enters your crown chakra and gradually fills your entire body, from the top of your head to the soles of your feet, cleansing and purifying all your physical, emotional, and intellectual obscurations. After your body is completely filled, visualize the white light passing through the soles of your feet, descending into the earth. The white light goes to all karmically-connected beings, particularly those who harbor negative thoughts towards you because of unpaid karmic debts, real or imagined. Imagine that the white light transforms into whatever they want from you, and that this satisfies them completely. At that time you no longer have a body made of flesh and bone, but a body of glowing white light—you are Vajrasattva. Then, if you have time, recite the Hundred Syllable Vajrasattva mantra one hundred and eight times. This is a very high meditation; it will transform all your perceptions into the purity state of the true nature. The next step is to visualize white, red, blue, and yellow multi- colored lights emanating from the third eye, throat, heart, and navel chakras of the Vajrasattva above your head, which enter your own chakras. Finally, Vajrasattva above your head dissolves into light, which descends through your crown chakra and into your heart. Shigpo Dudtsi says that when you are doing this practice you can also visualize Vajrasattva above the head of each and every sentient being. In this way, everyone is purified at the same time. And there is a third option. In some of Guru Padmasambhava’s teachings it says to visualize Vajrasattva as big as the sky, like a giant umbrella covering and protecting all beings. Chant the Hundred Syllable Vajrasattva mantra, and visualize all beings beneath Vajrasattva receiving his blessings and light. 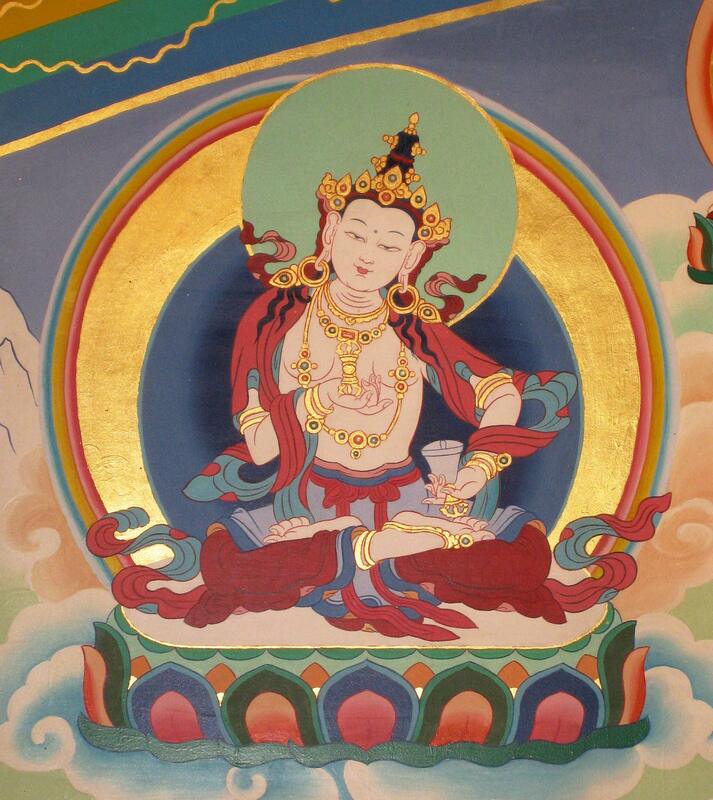 Finally, Vajrasattva dissolves into light, which dissolves into everyone’s heart, and everyone becomes Vajrasattva. Each of these three ways to perform the Vajrasattva meditation is excellent. You can choose the one that you find most comfortable and convenient. The entire universe is a mandala of love, compassion, and wisdom. Our primordial awareness is the center of that mandala.